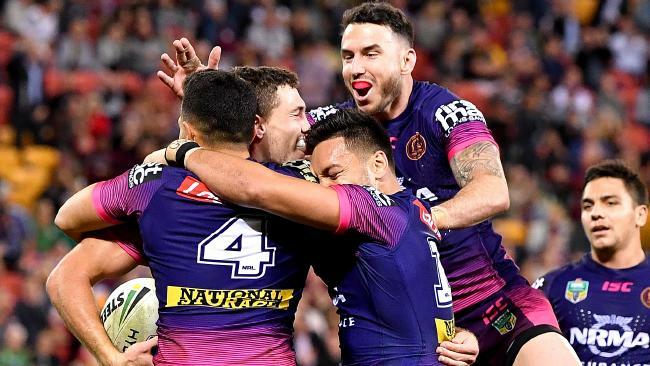 THREE try hero Corey Oates has helped the Broncos put a tumultuous week behind them to keep their finals hopes alive, with a hard-fought 38-18 victory over the Rabbitohs. If ever the Broncos needed to make a massive statement, it was in this showdown against second-placed South Sydney and they responded in fine form. 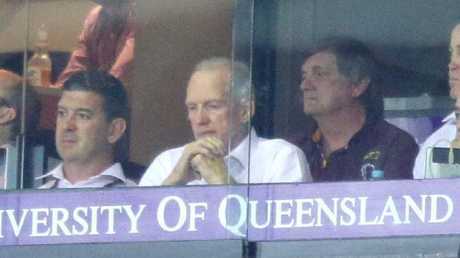 Brisbane had just suffered through yet another week of turmoil as developments around the Wayne Bennett coaching saga and his reported tension with CEO Paul White continued to unfold. Bennett however denied he knew of the 2020 offer after Brisbane's 38-18 win over South Sydney on Thursday night. "You can tell me things I haven't even heard about it," he said in his post-match press conference. They were also at threat of falling out of the top eight, making the clash a must-win for the Broncos. And it was a hat trick to towering winger Oates that not only kept the under-siege Broncos' finals hopes alive but handed Bennett his 400th career win in a massive week for the supercoach. 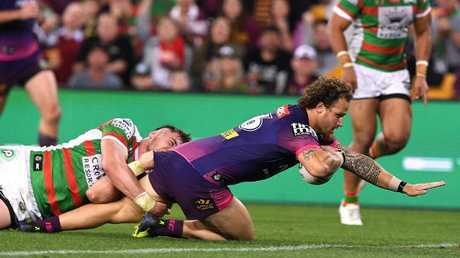 With the scores tied at 18-all in the 61st minute and the Rabbitohs playing with all the momentum, a soaring Oates changed the Broncos' fortunes, scoring off an Anthony Milford kick to hand his side back the lead. Two minutes later, a rampaging David Fifita beat four defenders - including monster lock Sam Burgess - to score his first NRL try. An intercept try to Kodi Nikorima with two minutes left on the clock sealed the deal for Brisbane. 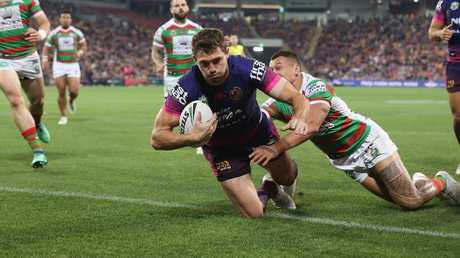 There was a scare for the Broncos midway through the game as the Rabbitohs' giant forward pack paved the way for South Sydney to make a comeback from 18-0 down, but they managed to cling on to claim the win they desperately needed. It was the exact response Bennett would have wanted from his side after admitting earlier this week he was concerned about how the coaching saga may affect them. He said after the game that the Broncos are used to the off-field distractions and he was mostly pleased with the way they responded after their mid-game lapse. "We've been in headlines all season," he said. "We were obviously good and had a few tough moments as well. We stayed at it and played the way that works for us. "We lost our way before halftime ... we responded great. "We didn't play a bad game last week against North Queensland. We came here with confidence from that." After back-to-back losses to the Bulldogs and Cowboys, it also seemed like a mission impossible to beat the Rabbitohs, who have been in red-hot form this season. 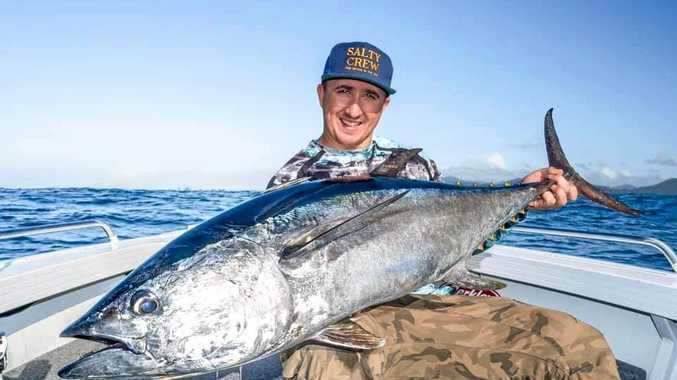 But Brisbane managed to produce one of their best attacking performances of the year to extend their winning streak over South Sydney to seven games. There will still be some concerns over their defence, particularly on their edges, but the Broncos will be more than satisfied with that win, which also helped boost their for-and-against back into the positives. It was clear Bennett was expecting fireworks between the two forward packs after he added Patrick Mago to his bench at the last minute at the expense of young utility Kotoni Staggs. While Mago struggled to pack a punch after he was brought on in the middle period of the game, the likes of Joe Ofahengaue, Tevita Pangai Jr and Josh McGuire all ran for over 100m to help meet South Sydney's muscle. One of the real standouts however was retiring forward Sam Thaiday, who played one of his best games yet this season. He ran for 100m and made a noticeable difference with his injection off the bench in the second half. Full-time BRISBANE 38 (C Oates 3 D Fifita K Nikorima K Sims tries J Isaako 7 goals) bt SOUTH SYDNEY 18 (R Kennar 2 H Hunt tries A Reynolds 3 goals) at Suncorp Stadium. Referee: Chris Sutton, Ashley Klein.